In this blog, I would like to describe the concept of the integration framework version 2.0 and how it works. 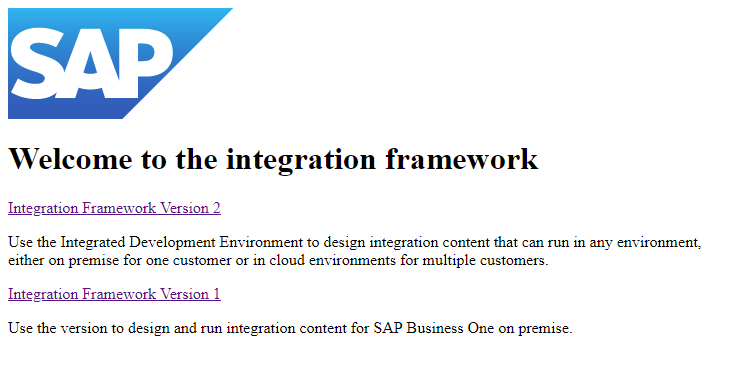 As described in the central blog, the integration framework version 2 is a new, alternative approach for the creation of integration scenarios and has been added with SAP Business One 9.3 PL04. It provides possibilities to run integration content for multiple customers in the cloud. The version 2 model offers an Integrated Development Environment (IDE) to develop scenarios. Why is it Possible to Run Both Versions in Parallel? Version 2.0 is going to other datasets and groups in the BizStore. Because of this it is also possible to use content from version 1.x and start up to continue to create content in version 2.0. The processing in version 2.0 is much faster than in version 1.x, because the model directly resides on top of the integration platform (B1iP). As described above it offers an Integrated Development Environment (IDE) for scenario development and uses the platform capabilities with a lower-level approach than the integration framework 1.x model. The integration framework 2.0 can be accessed with a different URL than version 1.x. Version 1.x is developed for running first on Premise, for a single customer/single tenant addressing all company databases of this customer. This version is currently also part in the cloud offering. The functional areas, such as defining the Sender, Inbound, Processing, Outbound, or Error Handling are separated and located in different areas. Version 2.0 is developed for running on premise and in a cloud environment, such SAP hosted, or partner hosted. This means multi-tenant handling is possible. An updated user interface in the form of an IDE is on offer targeting the development user. No additional tools are necessary, as the BizStore and its structure are included. The starting point in version 2 is to create a new Package. In this package one or multiple Scenario(s) can be created. The scenarios consist of one or multiple Steps. This hierarchy (package – scenarios – steps) includes an additional level to tailor/structure the integration content. Before starting to develop a new integration scenario, the partner development namespace (prefix) has to be defined. The namespace appears automatically when creating a new package. The basic concept of step creation remains the same in both versions (1 and 2). This means, steps can be synchronous and asynchronous. In asynchronous steps the system defined in the inbound can be different from the system defined in the outbound. Both types, synchronous and asynchronous, have an Inbound and a Processing phase. They differentiate at the end. Asynchronous steps don’t have an Outbound phase because the message is sent back to the original message sender, e.g. within an HTTP or Web service call. Get more information on the integration framework version 2.0 in this Training Material. 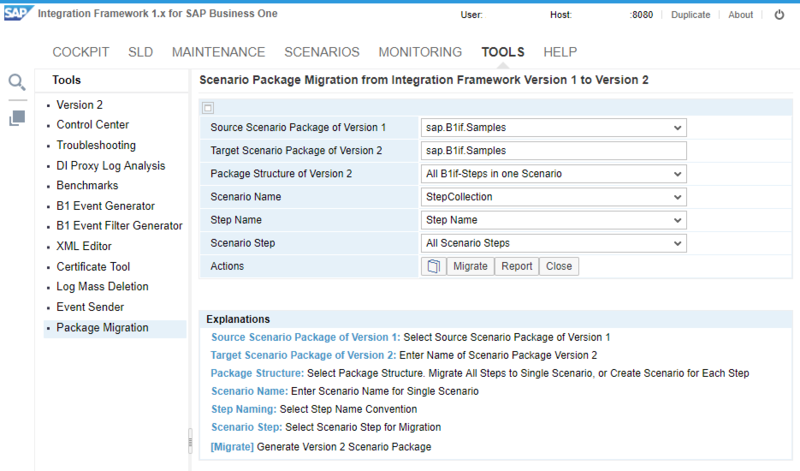 This document Example on How to Build a Scenario gives you an entry point to building scenarios in the integration framework version 2.0. Get more information on the benefits of the integration framework version 2 in this blog – Is it Worth Considering the Integration Framework Version 2? Good to read, I’m looking forward to it when our SAP add-on intercompany integration solution is also available on this version 2 very soon and can benefit from it! The integration framework version 2 is available with 9.3 PL04 and higher. It is not available in Release 9.2. For testing purposes you can try combinations that are not released, but not for productive purposes, you would not get support. There may be unpredictable side effects; we never tested it and you’ll have an unsupportable status of your landscape. So we don’t recommend this approach. Please also keep in mind that Release 9.2 for SAP Business One is no more in mainstream maintenance and it’s recommended to upgrade to the current Release 9.3. 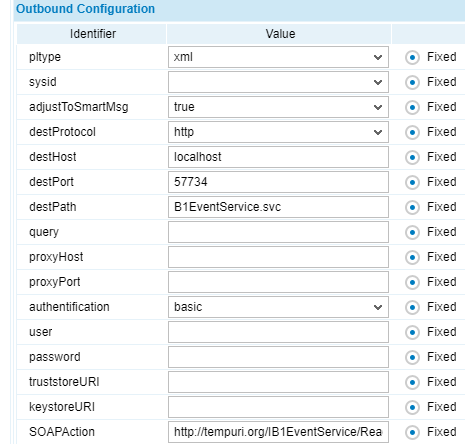 How can i make a outbound call to WCF Service?